WhatsApp is one of the most popular IM service that has a huge user base with around two billions monthly users. With the launch of WhatsApp Business accounts, it is also being used in businesses. With that said, businesses often have to send messages to numbers which are not saved in contacts. Even individuals also have to send messages to someone who is not in their contact list like for a quick inquiry, feedback, etc. But WhatsApp still doesn’t have an option to send messages to someone who is not in your contact list. By default, to send a WhatsApp message, you have to add the number to your contact first. In this article, I will cover several methods to skip that altogether. These methods allow you to send WhatsApp message from the desktop without adding contacts. So, let’s check them out. The first method to send WhatsApp messages without adding a contact is using WhatsApp API. WhatsApp has an API which is designed to add WhatsApp share button on web pages. This API can also be used to send a message to a number which is not in your contact list. Note: Add the respective country code at the begging of the number. When you open this URL in a web browser, it takes you to the WhatsApp Web. If you are already logged in to WhatsApp Web, it opens the conversation window with the mentioned number along with the text ready to send. You can simply tap the send button to send the message. And, if you are not logged in, it asks you to log in and follows the same process afterward. For longer text, simply use the spaces in between the words and it will automatically get converted to ASCII when you visit the URL. 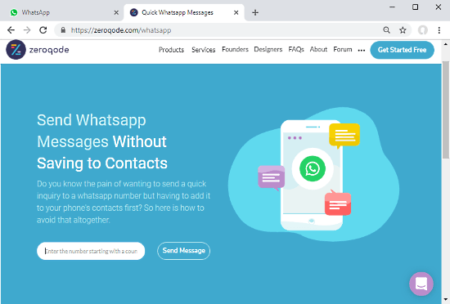 This way, you can quickly send WhatsApp messages to people who are not on your contact list right from your pc without the need of saving their number. Zeroqode is an online platform that offers various types of tools which otherwise required at least some sort of coding. It has a free online tool to send WhatsApp messages without saving to contacts. 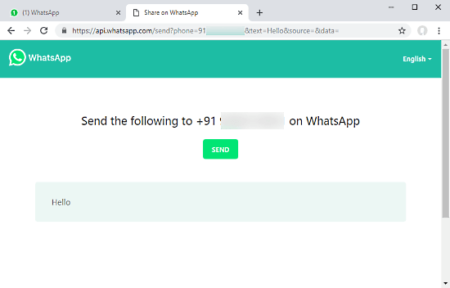 This tool also uses the WhatsApp API but it takes care of everything and offers you a simple text box to type the number. To send WhatsApp messages without the saving a contact, enter the number in the text box and press “Send Message”. Make sure you add the correct country code at the beginning of the number. When you do that, it takes you the WhatsApp Web and asks you log in your WhatsApp. Then, it opens a conversation with that number. Unlike the other method, here you have to type the message in the conversation. Then, you can send it to the person. With these methods, you can quickly send WhatsApp messages from a desktop without saving contacts. You can use any of these methods that you find convenient for yourself. Give them a try and share your thoughts with us in the comments.